An assortment of 16 pralines, truffle-filled chocolates and salted caramels. A sophisticated collection of irresistible pralines, truffle-filled chocolates, velvety ganaches and fleur de sel caramels, from an award-winning modern chocolatier. Our Contemporary Edition comes from an award-winning team of expert chocolatiers, whose passion is creating beautiful chocolates that taste as good as they look. 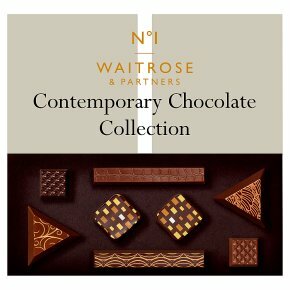 Irresistibly moreish flavours and ingredients from around the world are enveloped in Waitrose 1 chocolate, made to our own exclusive recipe. INGREDIENTS: dark chocolate (43%) (cocoa mass, sugar, cocoa butter, emulsifier (soya lecithin), flavouring), milk chocolate (24%) (cocoa butter, sugar, milk powder, cocoa mass, milk fat, flavouring), sugar, wheat glucose syrup, evaporated milk, hazelnuts, cocoa butter, milk powder, cream (milk), sweetened condensed milk, unsalted butter (milk), water, cocoa mass, almonds, raspberry purée, wheat flour, sunflower oil, humectant (sorbitol syrup), butter oil (milk), raspberry juice from concentrate, acidity regulator (sodium citrates, citric acid), butter (milk), invert sugar syrup, stabilisers (carrageenan, pectin), skimmed milk powder, Madagascan vanilla extract, flavouring, salt, carrot concentrate, sea salt, lactose (milk), emulsifier (soya lecithin), milk proteins, orange oil, barley malt extract, ground cardamom, preservative (sorbic acid), fat reduced cocoa powder, palm oil, shea oil, raising agent (sodium bicarbonate), colours (cochineal, curcumin, vegetable carbon, anthocyanins, riboflavin, titanium dioxide, iron oxide). For allergens, including cereals containing gluten, see ingredients in bold. May contain: peanuts,may contain other nuts.